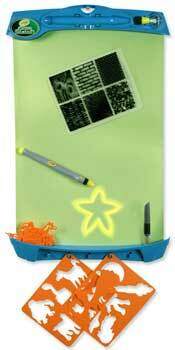 The Crayola Glow Station is a glow-in-the-dark drawing board that lets you create art with light. You hang or lay the poster-sized drawing canvas in a dark room and use the battery-powered Light Wand to draw with light, and your art glows in the dark and slowly fades away, making way for more artistic fun! Check here to find where to buy the Crayola Glow Station in stock and to compare prices on the Glow Station from all major toy stores online. Features of the Crayola Glow Station include the following. Use the Light Wand to write or draw freehand on the Glow Station drawing surface, or use one of the included accessories to add cool effects. The Crystal attachment for the Light Wand makes star shapes. Two stencil sheets and 13 stencil cut-outs can be used to make space and animal pictures. The texture sheet add spots, stripes, or feathers to drawings and stencil shapes. Try using the Glow Station to play games like hangman and tic-tac-toe, with the added excitement of having to finish the game before the writing on the glow in the dark board has faded away. Or use the included acetate transfer sheet and dry-erase marker to make an intricate drawing, then transfer the whole page to the Glow Station in one flash of light.